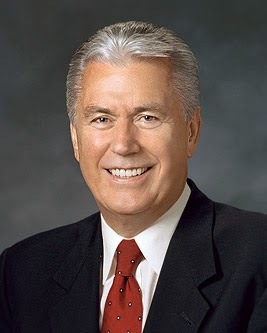 Elder Dieter F. Uchtdorf (born November 6, 1940) served as a Seventy from 1994-2004, when he was called as a member of the Quorum of Twelve. He served as second counselor in the First Presidency from 2008 to 2018. "As a child, when I would look at the little forget-me-nots, I sometimes felt a little like that flower—small and insignificant. I wondered if I would be forgotten by my family or by my Heavenly Father. "Years later I can look back on that young boy with tenderness and compassion. And I do know now—I was never forgotten. "And I know something else: as an Apostle of our Master, Jesus Christ, I proclaim with all the certainty and conviction of my heart—neither are you! "Sisters, wherever you are, whatever your circumstances may be, you are not forgotten. 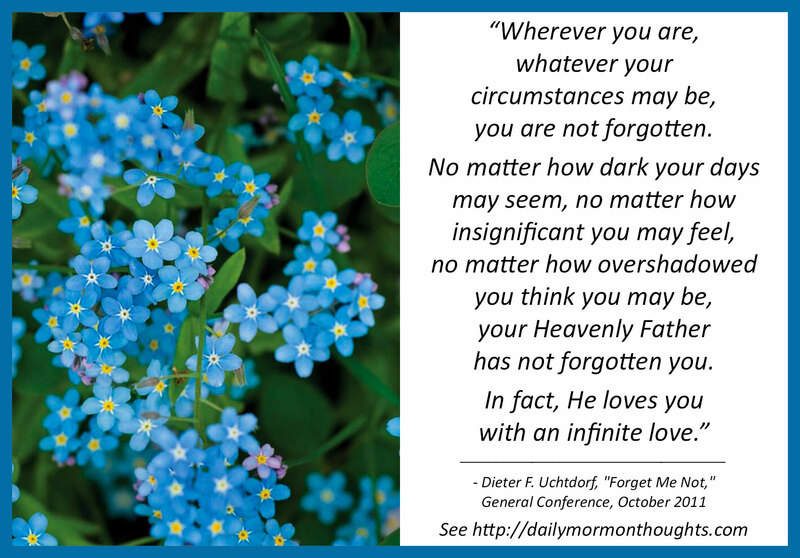 No matter how dark your days may seem, no matter how insignificant you may feel, no matter how overshadowed you think you may be, your Heavenly Father has not forgotten you. In fact, He loves you with an infinite love. "Just think of it: You are known and remembered by the most majestic, powerful, and glorious Being in the universe! You are loved by the King of infinite space and everlasting time! "God loves you because you are His child. He loves you even though at times you may feel lonely or make mistakes. "The love of God and the power of the restored gospel are redemptive and saving. If you will only allow His divine love into your life, it can dress any wound, heal any hurt, and soften any sorrow." This is one of President Uchtdorf's talks that is worth reviewing regularly. He spoke his words of encouragement and counsel to the sisters of the Church, but the counsel applies equally to brethren; we all need to remember that God has not forgotten nor forsaken us, and never will. President Uchtdorf testified that God loves us, and will always love us, because we are His creation and His children. Even when we feel lonely or when we know we have made mistakes—perhaps especially at those times—we can be assured that He remembers us, cares for us, and is eager to help and sustain us. We need only allow His divine love into our life! Labels: God, hope, loneliness, love, Uchtdorf Dieter F.